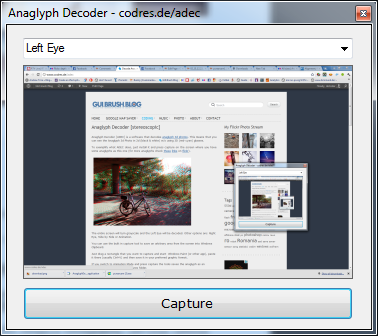 Anaglyph Decoder [ADEC] is a software that decodes anaglyph 3d photos. 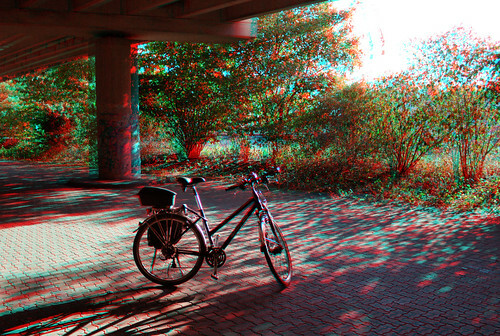 This means that you can see the Anaglyph 3d Photo in 2d (black & white) w/o using 3D (red-cyan) glasses. To exemplify what ADEC does, just install it and press capture on the screen where you have some anaglyphs as this one (for more anaglyphs check these links on flickr). If you switch to Animation Mode and press capture the tools saves the anaglyph as an animated gif to the <User>/Pictures folder. After you finish capturing just press the Escape key to turn back to your desktop. 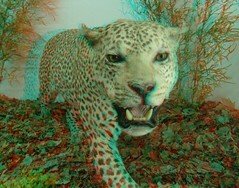 If you agree with the license you are free to download and use the Anaglyph Decoder. 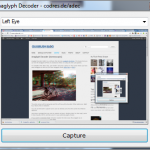 Anaglyph Decoder requires Microsoft .NET. Thnx a lot! It was useful.